Warmer summers, milder winters, more heat waves, more extreme rainfall events, and a drop of as much as two feet in Lake Michigan water levels. These are some of the long term predictions for the region due to climate change. 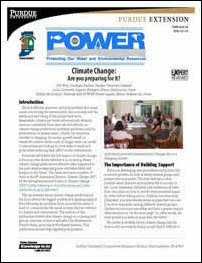 IISG’s Planning with POWER project has just released three new factsheets that offer land use planners ideas and insights into incorporating climate change concerns into local priorities. These free publications can be downloaded from our website. Climate Change: Are you prepared for it? This six-page factsheet provides an overview of climate predictions for northwest Indiana, including temperatures, precipitation, and lake levels. Strategies for local planners to prepare for climate change include: local food production; smart growth; and green infrastructure. How do you make the case for including climate change issues into future planning? Local planners should consider how they are framing the issue for the public and for policy makers. This four-page factsheet provides insight into useful and practical approaches. This four-page fact sheet is chock full of ideas for communities to prevent stormwater runoff, flooding, and soil erosion. The ideas range from ambitious (incorporating smart growth) to simple (encouraging tree planting).